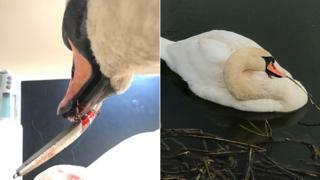 A swan "could have starved to death" if a large fishing hook not been removed from his tongue. The RSPCA said the bird was unable to feed because of hook, which also had a line attached. A member of the public spotted the distressed male at Nene Wharf, Turnells Mill Lane, in Wellingborough. Officers were able to a entice the mute swan with food before safely capturing him and taking him to a vet to have the hook removed. The animal, which is now recovering at Leicestershire Wildlife Hospital, was rescued by the RSPCA on 21 March. Animal Collection Officer Rebecca Frost said: "The swan was obviously distressed and will have been struggling to feed. "If he was left much longer he would have died." The charity has issued another warning over fishing litter. Ms Frost said: "Discarded lines and hooks can easily snag water birds and other wildlife, causing terrible injuries and suffering. "Most anglers are very responsible when disposing of their litter, but it only takes one careless person to endanger the life of an animal." The charity say once the swan is rehabilitated he will be released back into the wild.